Here in Los Angeles, we currently have between seven and twelve local Transition groups (depending upon at what stage of development you wish to begin counting them). And we're eager for more. The nature of our greater L.A. area is that eventually we will need to have in place a vast network of local groups, each neighborhood working on this process. 1. Understand the nature of a Transition group. A Transition group works to grow local resilience -- our ability to flex and adapt in the face of great change. Three specific changes, actually: peak oil, climate change, and economic contraction. When taken separately, there are a lot of possible answers to these huge problems. But when we consider the trio of crises together, the number of viable solutions gets a whole lot narrower; there really are only a few general avenues which will work. Thus we try to measure everything do within the Transition movement against this sweeping trio. Within that framework, we understand that we must take positive action. Preparation for peak oil, climate change and economic contraction means we have to change many things in our physical world. It's best to make these changes now, while we still have somewhat-cheap oil and some access to financial capital with which to do so. Thus in our L.A. groups you'll find people working together to build food gardens, install water harvesting equipment, support bicycle transportation master plans, set up time banks/bartering, and much more. I like to use David Holmgren's Permaculture Flower diagram to describe the panorama over which we are taking action. Transition groups realize that in order to cope with the triple crisis, transformative change is necessary in every single realm of human endeavor. The trio of crises affect our inner landscape as well. They affect our psychological and perhaps our spiritual outlook. Peak oil, climate change, and economic contraction call into question our definition of ourselves, the dreams we have been raised to expect, our place within our community, humanity's place within the circle of life. At some point, Transition groups address this inner Transition as well. The Transition approach is by nature a grassroots, community-centric approach. Our "Cheerful Disclaimer" explains it quite nicely. In all the actions we take, we're trying to implement solutions on a community-wide basis. While some of our reskilling type events might appear to be focused on individual skills, or family-level lifestyle changes, they come from concern for the overall skill portfolio of the community, and the overall social dynamic of peer influence. And while there's currently a debate within the broader movement about the role political action might eventually play, for the most part Transition groups aren't very active in conventional politics. Instead, we focus on actively creating the necessary changes right within our immediate home communities. 2. Make a commitment to lead. 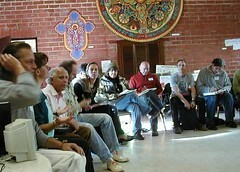 Within Transition circles, the person or small group of people who get a local group started are called the "initiators." I like to think of them like fire-starters, creating a little spark and gently blowing on the tinder until the flames of widespread action jump up. As an initiator, you have to be prepared to hold the place for this group to happen. Holding a hope, a vision, a dream, that one day there will be a dynamic circle working on these things in your own local neighborhood. Holding a physical place, going there regularly and consistently, waiting for others to join you, and getting small-scale activities going for those people who are gradually coming on board. Sometimes it takes quite a number of months until the action gets going. (for me it took a good year or more) I find that if you know from the outset it's going to take some time, then your expectations are in line with reality. You aren't as easily disappointed when in Month 2 you don't have a circle of 50 people already. Our Transiton South Bay LA group didn't use movies as the gathering point, at least not right away. They started in a coffee shop. Their initiator publicized that she would be at a particular coffee shop at a specified date and time, and people could join in. Over a period of months, a group of like-minded people formed, and from there they branched out into occasional movies and other events. What kinds of events should you start with? That depends on who you are as an individual. One of the basic concepts within the Transition approach is that people will offer to the community from what they are passionate about. If you're a gardener, start with gardening topics -- you might teach others how to grow food. If you're a bicyclist, start there. Offer a local bike ride, or a hands-on bike repair workshop. Allow your creativity to roam. We set up our first seed swap because I had never been to one and thought it would be fun. Last night someone proposed starting a neighborhood work group because she needed help personally. What would you like to see happen? That is the best place to begin. In our first days in my local neighborhood, we designed events such that they would be successful if only 5 people showed up. We kept our expectations small and simple. We didn't invite in big-name speakers who would expect to present to a huge crowd (or expect a fee). That way we weren't disappointed if few participants showed up, and we were thrilled beyond words when many came. Once you start, never break the chain. At each meeting, already have the next meeting's date and topic planned. Perhaps even have a printed flier to hand out. We learned this the hard way: One of our local groups had built up to nearly 50 followers, then broke the chain of meetings and took a full year or more to get the group energy rolling again. Never breaking the chain means that even as you're preparing for your current meeting, you've already planned the next one, and you're formulating ideas for the one that is two out. You always want to be able to announce "see you next time when we'll be talking about ... (and bring a friend!)" In the Transition Handbook, Rob Hopkins refers to this as "harvesting" email addresses. At every event, have a simple sign-in sheet to collect names and email addresses of each attendee (perhaps phone and zip code, too, see below). As we expand into new parts of our vast city, we are discovering that email isn't necessarily the best way to connect. While there are pockets of people who are intimately internet-connected, there are other pockets where people hardly use a computer. Thus we are learning to adapt. Some of our local groups are considering reestablishing the old-fashioned phone tree. Meanwhile, because we in L.A. are working within a vast urban area, we know that eventually there will be many local groups. I strongly encourage all of our local groups to collect zip code information at the same time as they collect contact info. That way, down the line, we can help people from outlying areas find each other as fellow locals come aboard the movement. If you're going to get people involved, you have to let them know about it. You have to get the word out. Here in L.A. there are several ways that initiators have done this in the earliest stages of their local group. I started in my own neighborhood by putting paper fliers at the public library. The fliers described the event on one side of the page, and on the back side explained the triple crises and gave our website. Our Northeast L.A. group grew out of a peak oil group which had an existing following of email contacts. Thus publicizing their earliest events was done internally to the old group. Another L.A. area initiator began within a church, where she put the meeting information into the weekly church bulletin. Transition Mar Vista began within a yoga center. Thus their earliest publicity included fliers in the yoga center entrance. Transition events were offered through the yoga center calendar as well. (Note: If you are working within an existing local group, dig deep and get creative. Capitalize on any connections you can see between the purposes of the two groups. Example: connections between faith communities and the Transition approach). In the early days, I posted meeting notices to other local "green" groups. If you are Facebook-knowledgeable, this one might work for you (although I did it in the pre-Facebook days). You can capitalize on the growing mentions of Transition in the green press. My local group also had devoted early attendees who took paper fliers out to other groups they were in regular contact with. As my local group progressed, I began learning how to get meeting notices into the free calendar listings in local newspapers. Within the Transition movement we often talk about "reskilling" or acquiring new skills to cope with this new age ... for a Transition initiator, publicity is a skill you will need to embrace and acquire. Publicity serves two huge purposes. True, it does help get bodies to your meetings. But in a broader context, publicity tells everyone who reads your blurb that SOMETHING IS HAPPENING. That little paragraph in a local newspaper says "there is a group, alive and well in your local neighborhood, that is taking action on these things." "There are other people who are concerned, people who care." Over the long term in your community, getting this message out consistently is perhaps even more important than getting participants to your meetings. More on publicity. 6. Use a support team. Let's face it, being an initiator can be lonely sometimes. You might feel like you are the only one in your neighborhood who knows (or cares) about the potential horrors of peak oil or climate change or economic contraction. And meanwhile it takes a bit of time to get a local Transition group started, to get down to work on solving or mitigating or avoiding those problems. You need a support team -- a team of cheerleaders to keep you going. Reach out to teams in other areas. This is no longer "the early days" for Transiton in the U.S. -- there is now a sizeable network. They even offer online courses. Connect by email with nearby initiatives, even if they are so far away you might never travel there. Read Transition news (national and international). Meanwhile, learn, learn, learn, and read positive news sources to keep your spirits up. Additionally, realize that the biggest changes are internal -- they're not visible. Someone who is "greening" their lifestyle in one way (say, starting to carry cloth bags) might not be visible to someone else whose first baby steps were to set up their family composting operations. Neither one of these people is recognizable when they're in their car on the freeway. Each of these people might feel very alone until they find common discussion at a Transition event. Thus while you might feel you are "the only one," trust that there are plenty of invisible partners out there. Far more than you can even imagine. Joanne Poyourow is the initiator of Transition action for many parts of Los Angeles, and is part of the core team of the Transition Los Angeles city hub. She is the author of several Transition-related books, and blogs at Transition US.